Snowy Moose Creations: Shake Shake Shake, Shake Your Santa! 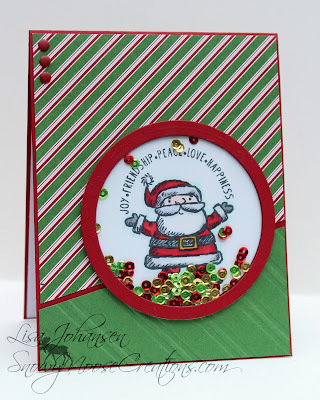 Right now at the Jingle Belles blog they have a terrific challenge that was brought to them by one of the frequent players of the blog, Marianne of Marianne's Cards 'n Stuff. We can create a shaker card or a card that features Santa on it or just join them together to create a shaker card that has a Santa on it. Well, I love Santa and I love shaker cards so I opted to do both! I used the SU set Get Your Santa On and colored Santa with Copics, plus added some Wink of Stella on his coat. The circles were cut using the Spellbinders Dies. The shaker portion was filled with sequins from the Classic Christmas Mix offered at Pretty Pink Posh. The DSP and card stock is from SU. The sketch is a previous one from Freshly Made Sketches. Thanks for stopping by! Did you know there are only 199 days left until Christmas? It's true! Your card is awesome ... what a perfect use for those tiny sequins and he looks like he's throwing confetti in the air to celebrate that he has all of his packages delivered ... so very glad you joined us at Jingle belles. What a fun shaker! LOVE it! How absolutely lovely - not to speak of stunning! I've just started doing shaker cards and this will very likely be an inspiration for more... and another technique, too. So happy you liked my prompt. Your shaker is just perfect. Love the clean design and traditional colours.